The aromatic herbs play a very important role in the Mexican cuisine. Besides the native herbs of the country also many others have been adopted that have come from different cultures. A clear example is the coriander that apparently comes from North Africa. Although it is not Mexican is one of the herbs that identifies the most the Mexican gastronomy. 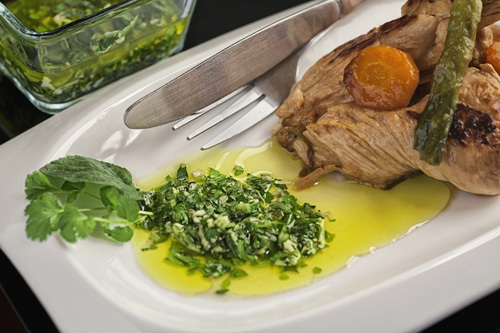 The coriander’s flavor that is almost citrus and slightly potent is combined in a divine way with the freshness of the spearmint. The salsa also has a spicy touch because chili and garlic is used in its preparation and to complement it the lime’s acidity and the ginger’s slightly spiced touch are used. It really is a salsa that has an explosion of flavors . This salsa can be used to put to a beef cut, or to a cecina or even to an arrachera. It also has another modality because it can be used as dressing of your salads and if you want to enjoy it in a very simple way, just taste it with bread. In this recipe you only have to cut and mix, it really is quite simple. It is very important to use the spearmint in its fresh version if not the salsa will lose its charm. The salsa acquires a spiced touch with ground ginger but you could also grate 1/4 tablespoon of fresh ginger and in this way the salsa will have more flavor and aroma. If you chop fast the salsa will be ready in 5 minutes . Separate from 5 spearmint sprigs the leaves from the stalks. Upon completion discard the stalks and reserve the leaves. Finely chop the spearmint leaves that were separated, the jalapeno pepper with the one you worked, 1 garlic clove and 5 coriander sprigs. Upon completion put all these ingredients in a bowl. 6 tablespoons of Extra Virgin Olive Oil. Mix very well the coriander and spearmint salsa with a mixing spatula. * Since fresh herbs are used in the preparation, the salsa will only last 2 days in the refrigerator. Did you like the Coriander Salsa? This ginger will give another dimension to the salsa. In this recipe you are going to cut a lot and the best knife is needed. A good chopping board is also going to be needed.